This season we are taking the classic Ants on a Log snack and throwing a holiday twist on it! 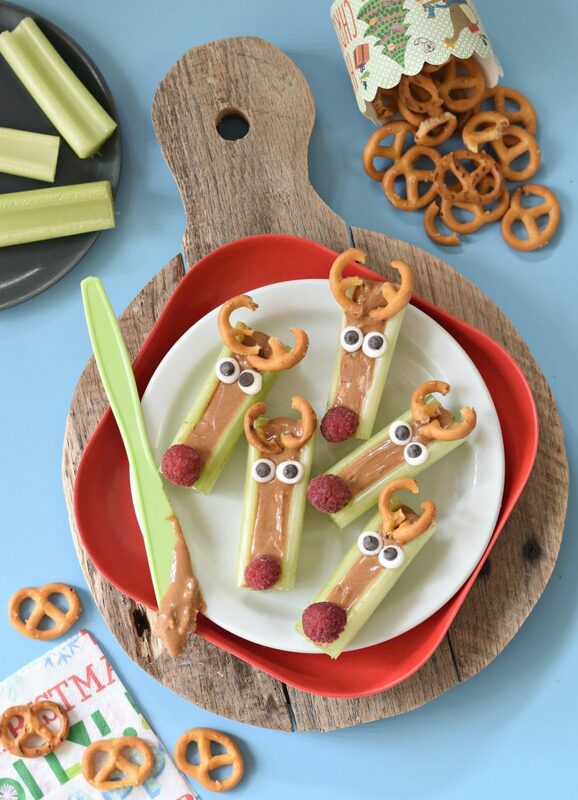 These Peanut Butter Celery Reindeer Sticks are a healthy option for moms out there wanting to feed their kids something fun yet still maintaining a majority clean eating lifestyle. 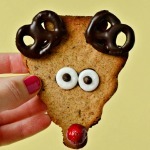 I love making Christmas treats with a healthier twist (Savory Cracker Gingerbread Houses, Ugly Sweater Pizzas, and Santa Hummus Dip, for example) and still safe for those with food allergies*. *These Ruddie Sticks can easily be made nut free by replacing the peanut butter with your favorite seed butter of choice. Slather the nut or seed butter into the celery ribs. 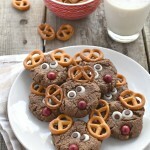 Add the antlers, eyes, and nose for the full Rudolph face. Watch your kids eat and devour this snack! Now if you’ll excuse me, I have Peanut Butter Celery Reindeer Sticks to eat. Because even though I’m a grown woman, I still eat stuff like this, just like a 4 year old does.